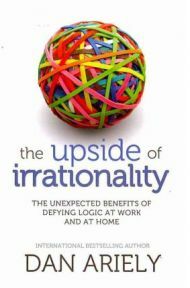 Dan Ariely’s The Upside of Irrationality is a summary of the behavioural patterns that he has been studying over the years. The book is a follow up to his Predictably Irrational, which was a runaway success when it came out, and The Upside of Irrationality shows every sign of following in its footsteps. What it is is a study of the irrational way in which people behave in a manner that goes against their best interests. The book tries to change the “rational consumer” principal into advice on how to lead a better life and it is fairly successful in this endeavour. However, some of what Ariely points out as habitually irrational behavior cannot be changed despite out best efforts to do so, which is why ‘fairly successful;’ best describes Ariely’s work. However his experiments into irrationality continue to be fascinating. Especially when he points out that when big things are at stake, people tend to underperform, despite their best efforts, because their nerves get the better of them. This section is aimed at businesses where large bonuses lead to a sharp decline in performance, something that very few executives are willing to accept as a reality. Or he talks about online dating where the return on your investment is so poor that you may as well not bother. What he does point out here is that under these circumstances most people are likely to make a bad decision and he does not offer any solutions. Presumably most readers would take to the sections where he does offer practical advice in the face of irrational behaviour. For example he talks about how people tend to indulge themselves in pleasure while taking breaks from unpleasant, painful tasks or emotions. With the result that when the unpleasant returns – as it always will – the emotional agony is much greater because of the break. His suggestion is to continue straight on with work that is unpleasant because even a slight break will reset the system and adapt it to the expectation of pleasure so that when the unpleasant situation recurs it feels as bad, if not worse, than before. This is an insight that would not occur to most. The section on motivation in the workplace is also likely to appeal to many readers. For example Ariely says that making tasks even slightly meaning makes them more satisfying and therefore easier to complete, even if the task is not very demanding or results in mechanical substandard production. And he backs his information with his experiments, some of them carried out as far away as rural India. In one experiment, people are asked to create an origami creature and then are asked how much they would pay for it. Both creators and non creators are asked this question and Ariely discovers that the creators put a higher price on their handiwork. This he calls the ‘ownership bias’ and it exists in the field of ideas as well, where people overvalue their own ideas and undervalue or trash those of others. He also talks about attitudes towards pieces of craftsmanship that are created only to be destroyed – where the potters of Kumartuli come to mind with their Durga Puja creations. Presumably here the pleasure of having their work exhibited before so many admiring crowds compensates for the ultimate destruction. Ariely’s style is breezy and easy to read with Greek myths thrown in to illustrate what he is trying to say. On occasion it trips up when he elaborates or some rather obvious findings, but on the whole it is a useful and entertaining piece of thought. No Comments on "Irrational Logistics"